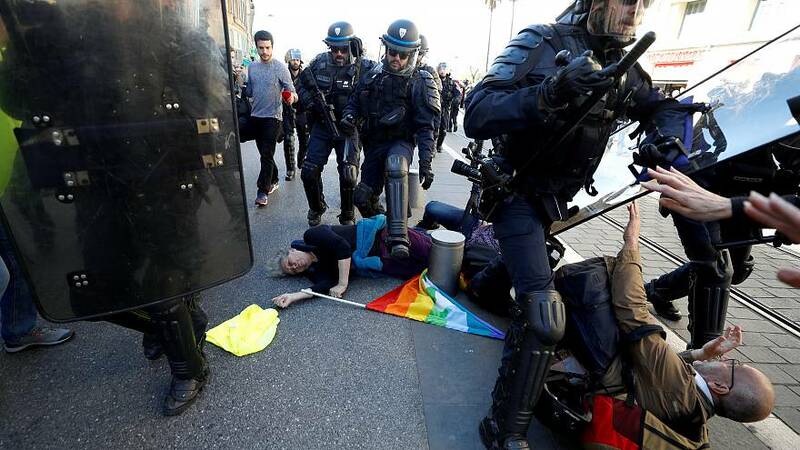 A pensioner "was pushed by a police officer" during last weekend’s "gilets jaunes" ("yellow vests") protests in Nice, southern France, the city's public prosecutor said on Friday as a judicial investigation was opened. Pictures that were taken by the news agency Reuters show Genevieve Legay, 73, lying on the ground after apparently hitting her head on a metal bar. Legay, the spokeswoman for the local office of an anti-globalisation NGO, fell as police tried to clear protesters from an area of the city where protests were banned. Her family filed a complaint for "willful violence by armed persons holding public authority on a vulnerable person," their lawyer told France Info. For the first time at a "gilets jaunes" protest, French military units were on standby to help police if required. The demonstration in Paris was far more peaceful than last weekend's, which saw some landmarks on the Champs Elysees torched and looted. The "gilets jaunes" protests are named after the bright yellow vests that French drivers display in their vehicles to signal they support the movement. Demonstrations started in November against the rise of fuel tax prices but have snowballed into a bigger backlash against Macron's government. Across France, 40,500 demonstrators turned up last Saturday, up from 32,300 the previous weekend. In Paris alone, the number of demonstrators fell to 5,000 from 10,000.